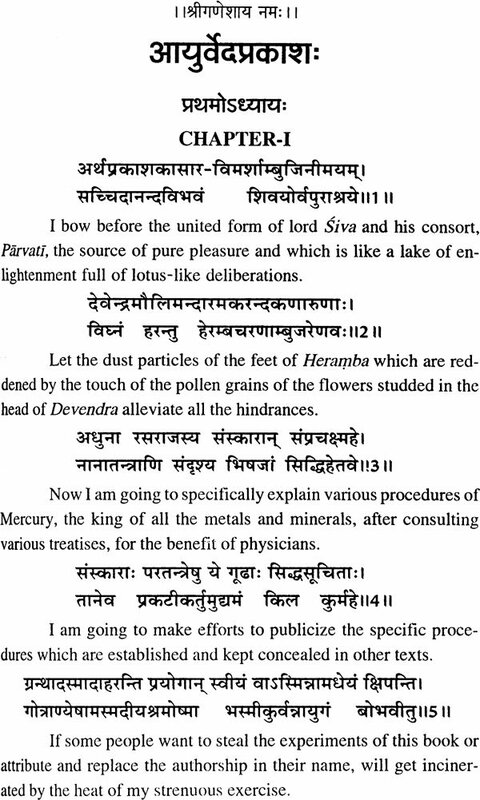 "Those physicians who expect result from mercury without feeding it black mica, gold and sulphur and those farmers who expect yield from the field without sowing seed are fools" This statement clears all doubts and fears about the practice of Mercurial system. Those who come across the statements about the magical results of mercurial compounds should view them in this perspective. 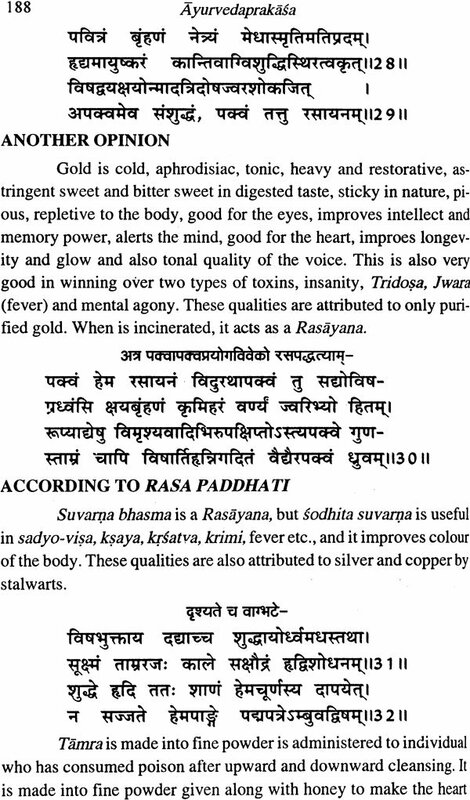 Rasasastra the mercurial system is the first science that has warned about the toxicity of using raw and unprocessed Mercury. It has cautioned to the extent that unpurified Mercury could cause even death. Therefore the iatro-chemistry of Rasasatra should be understood safe and effective since the raw materials undergo diligent processing before making them into a dosage form. 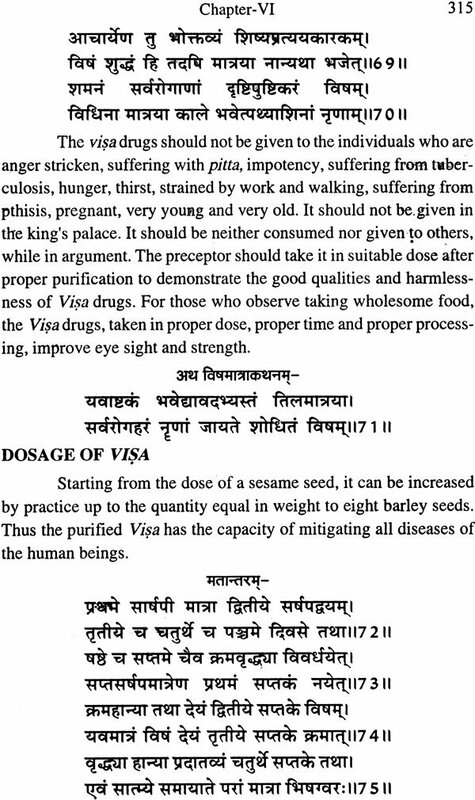 Ayurvedaprakasa gives practical details of making mercurial medicines. The author Madhava Upadhyaya mentions at the outset that he would furnish only practicable technicalities in this book and would not give the details which he has not experienced. He emphasizes the significance of both theory and practice equally in learning Rasasastra. 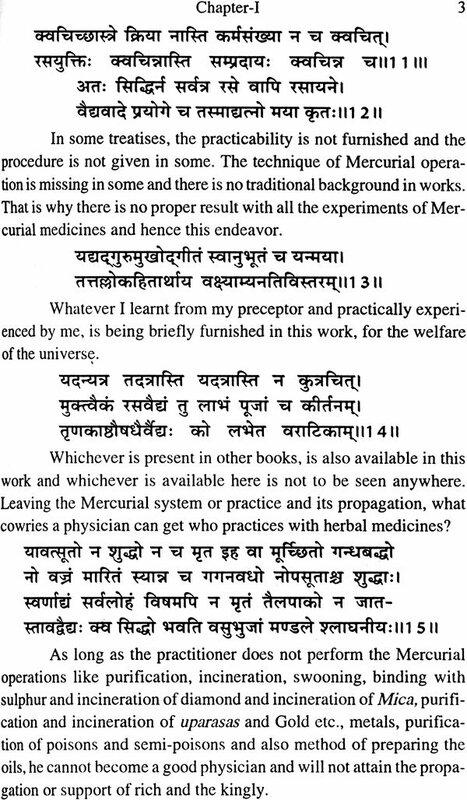 The author laments over the quackery in Rasasastra practice and emphasizes the importance of following the mercurial procedures diligently. This is evident by going through this precise compendium of Rasasastra, the Mercurial system. Apart from his personal experiences he has also quoted the practical oriented procedures from other text books -Rasarajaiaksmi, Rasapaddhati, Rasaratnasamuccaya, Resecintamani, Yogsteretigini etc., famous books. 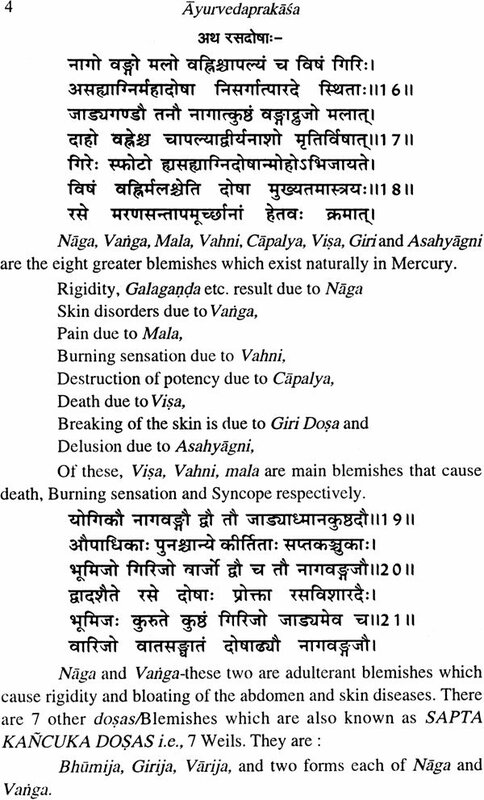 Ayurvedaprakasa seems to be the essence of the material available until time of Miidhava Upadhyaya. The subject matter has been presented in six chapters in this book. 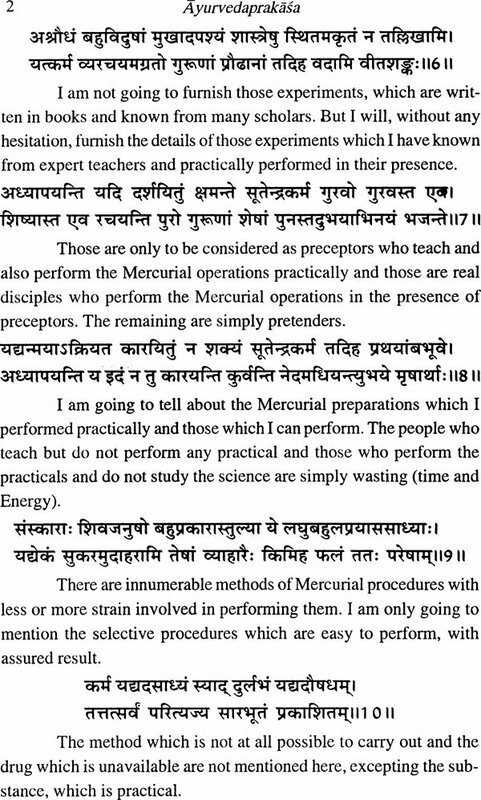 The first chapter deals with the significance of Mercurial system and the importance of learning this science under direct supervision of an able and benevolent guru. 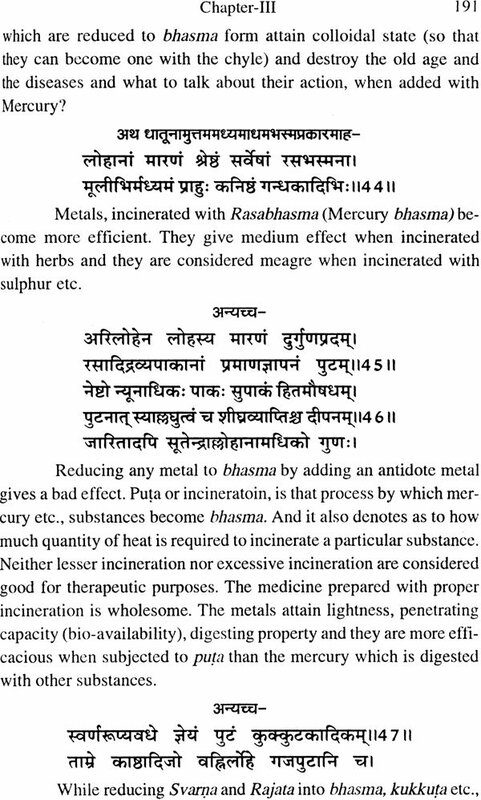 The properties, blemishes, purificatory measures along with semskara, bandha etc., of mercury that transform the status of this substance from a poison to a cectar, The methods of preparing Rasa bhasma and Ressussdhis and administering them on the body are given. Though it looks like a magic, certain transmutational techniques and an animated pill are also described in this chapter. Second chapter provides the details of uparasas, the mercurial associate drugs i.e., sulphur, cinnabar, mica, orpiment, realgar, stibnite, lapis lazuli, chalk, ochere, green vitreol are described by their features, purification etc., methods along with usage. The metals are described in detailed manner in the third chapter. 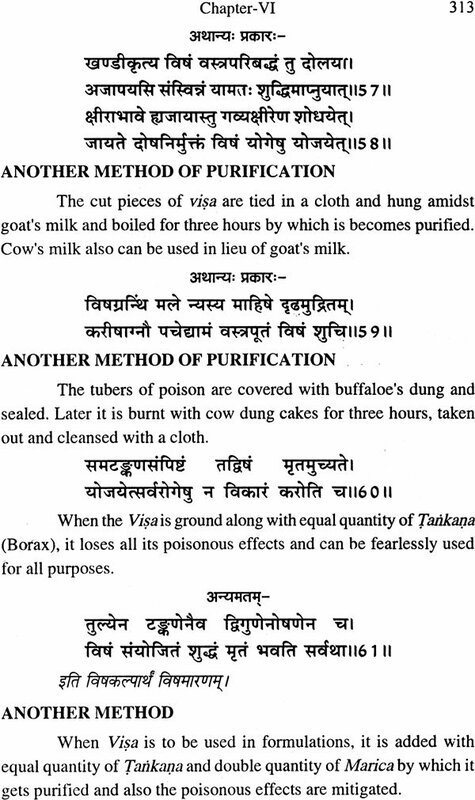 The purification and incineration methods of metals are given with dosage and usage. 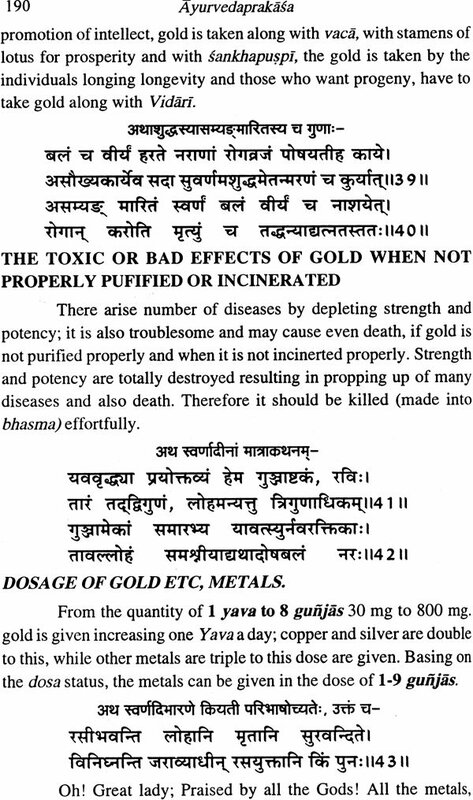 These derivations alleviate all the fears about the metallic preparations for therapeutic use. The details of adverse drug reactions that occur when these metals are improperly used and also the management furnished in this context give encouragement for successful practice of Mercurial medicine. The minerals like cha1copyrites, ironpyrites, bornite, plum- bum oxide and the alloys like bronze, brass and five-metal alloy are described in the fourth chapter. 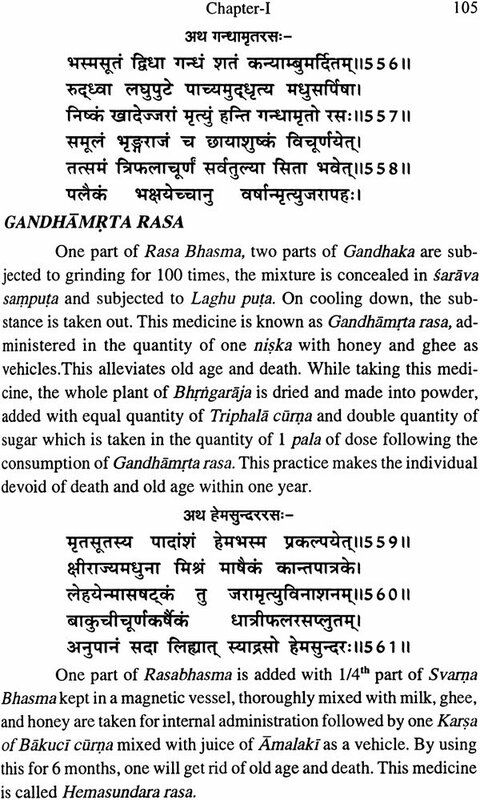 The same chapter contains the details on collection, purification, and processing of Silajatu into a dosage form. The fifth chapter deals with gemology. The mercurial system and its relation with precious and semiprecious stones along with their therapeutic usage apart from the astrological connections with planets are given in detail. The valuation system of gems is given in a such a methodical manner that it can be adopted even today with slight modifications as per the present measurement system. 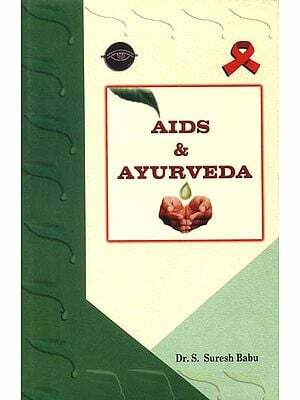 The toxicology is detailed in the sixth chapter. The poisons or the toxic substances of static and mobile nature are described with toxicological effects and managements apart from their individual therapeutic usage. 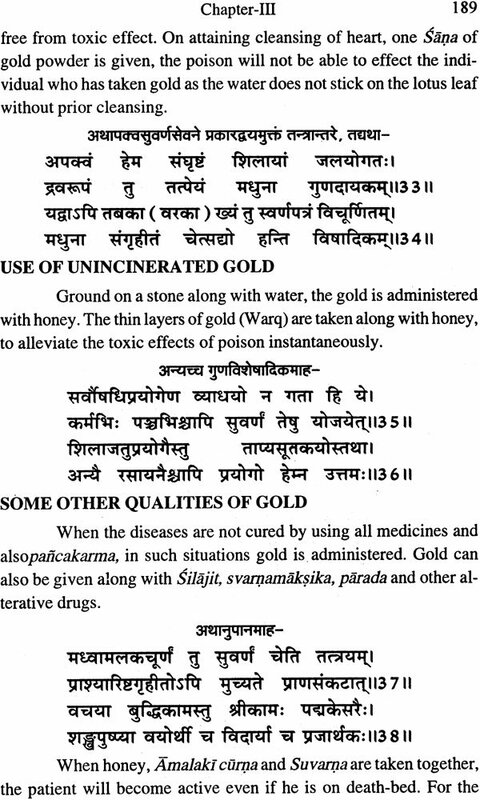 Certain sacred chanting (mantras) are also given to overcome instantaneously the poisonous effect caused by toxic substances (vise) and also snake bite and the scorpion sting. 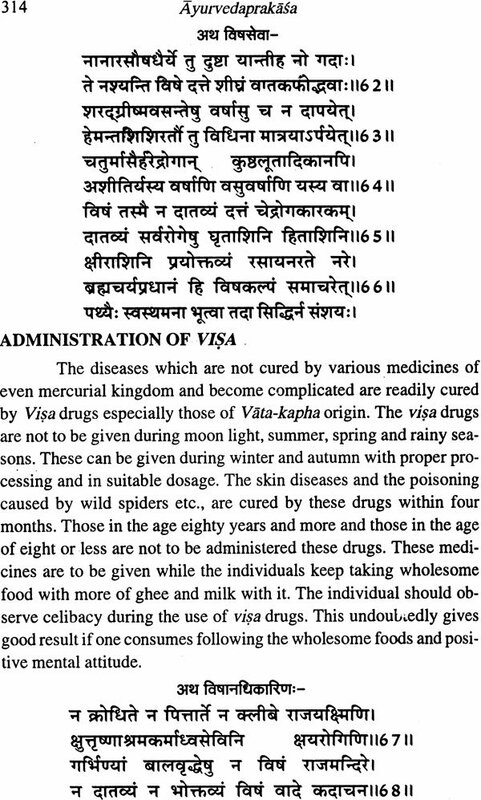 Certain anti-poisonous medicines are also given. 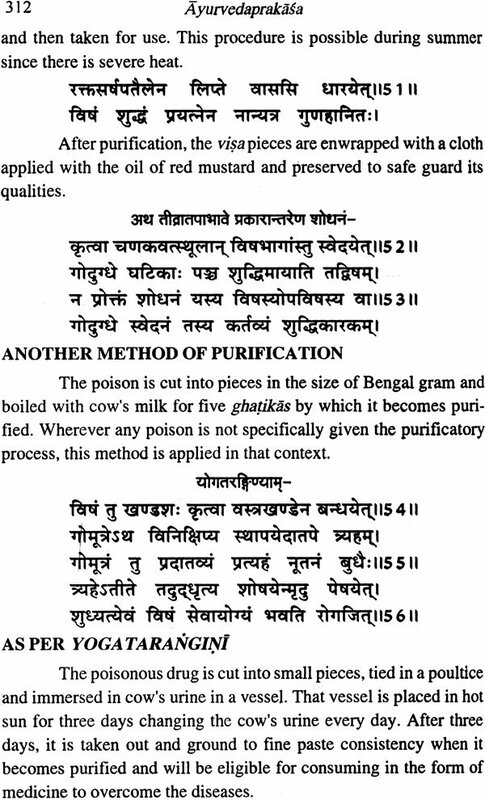 And finally a precise description of preparing alkaline substances is provided to wind up the text. 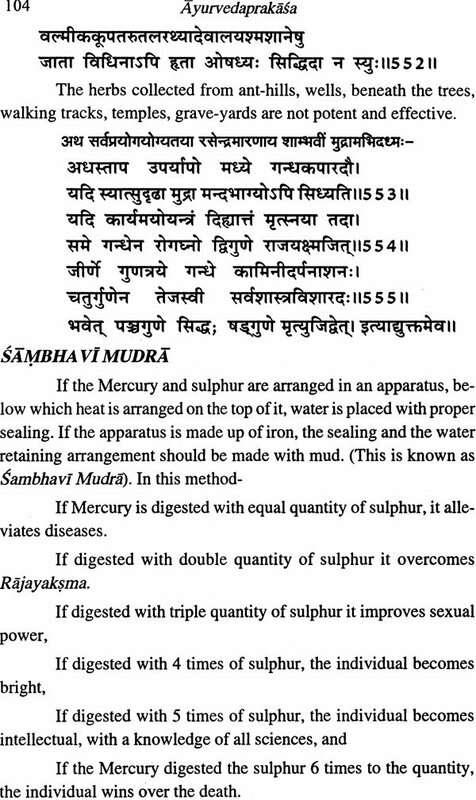 Msdhava upadhyaya, the author of this treatise belongs to Sarawata Brahmana dyanasly of Saurastra. 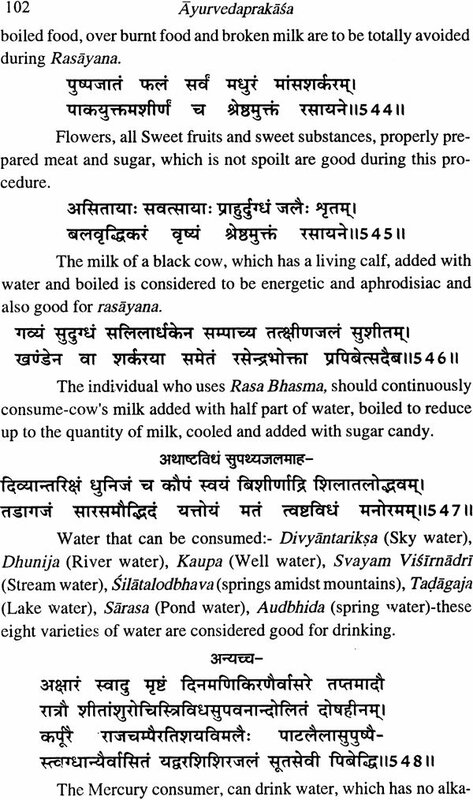 Referred to as Rasamadhava by the followers of mercurial medicine, he lived in Varanasi when he composed this text Ayurveda prakasa. There are many Mtidheves who have written books on various desciplines of Indian Philosophical thought system apart from Madhavakara the author of Madhavanidana. 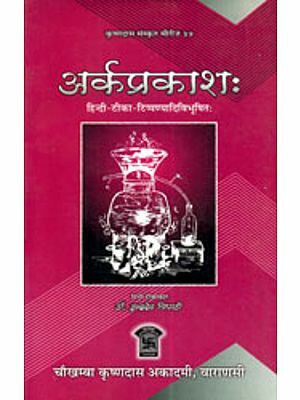 Though there is no hint about the time of Madhava upadhyaya, the author of Ayurveda prakasa, it can be understood by the referances of phiranga, Rasakarpura etc., that this author may be placed in the mid seventeenth century, A. D.
As said earlier this book is a ready reckoner for scholars, practitioners, and researchers of Rasasatra. In view of the increasing demand for translation of such important work it has been ventured by me. The experience of writing a text book in Rasasastra and teaching the subject for the last 38 years with the blessings of my father, late Sesagiri Sarma, his guru Hakim Hussain Zulkhemain and my gurus prof. Hari Shankar sarma ji and late. M. U. Bahadur ji has helped to a great extent. Dr. Bhuvana, Dr. Bhagya, Dr. Shiva, Dr. Sai, Dr. Vijaya and others have helped in preparing the script. Pavan kumar Sharma, my disciple in sitar has assisted in preparing the index and introduction. I wish them all a very bright and prosperous career. My wife Smt. Padmaja, my daughter Dr. Sivapriya, my son-in-law Dr. Jayakrishna Kulamarva, my son Chayanath and my daughter-in-law Anuradha have encouraged me throughout this project as always. I wish them all a very bright future. Sri Brijmohan Das Gupta of Chowkhamba Sanskrit series office, Varanasi has readily accepted for taking up this project for which I am very much grateful to him.